Hi, I’m interested in Silkscreen T-shirt Screen Printer 1 2 4 6 8 Colour Printing Equipment Training Supplies Inks Kit. Please contact me. Thanks! "We'll set you up to do printing ... and 'keip' you happy thereafter!" From One Colour Deluxe Kit (R 5,497.00) , Two Colour 2-station Carousel T-shirt Printer, Four Colour 2-station, Four Colour 4-station, Six Colour 4-station, Eight Colour 6-station Carousels availabe. All printers come complete with Screens, Squeegees and T-shirt Boards. FREE TRAINING with the purchase of equipment, held at our Johannesburg offices, by appointment only. Also available: Flash Dryers, Heat Presses, Screen Printing Darkroom Equipment (Light Source, Exposure Units, Coating Troughs, Jet Spray Guns and Wash Out Bays). 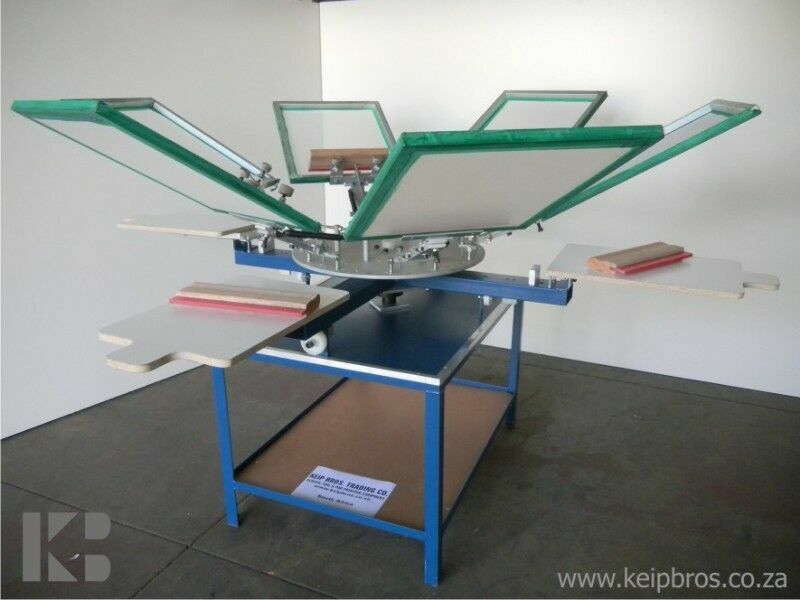 Check out our website keipbros for more information, photographs, prices and quotes. Also available: Hot Foiling/Embossing Equipment, Pad Printing Equipment and Etching Presses. Visit our showroom: Trading Hours 7.30 AM - 4.30 PM Monday to Friday and 7.30 AM to 3 PM. Closed on the weekends and public holidays. The FM-20 is a fill by mass liquid filling machine. Optional dive nozzle for high foam products. Includes lid closer or bucket closer. With CNC or touch screen control unit. Payment and rental options available. Full service back up and training available.